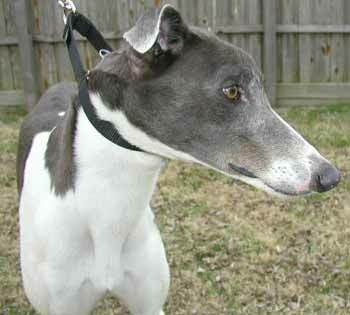 Salty, aka Pin Oak Salty, is a small blue and white 2½-year-old male greyhound, born July 9, 2000. 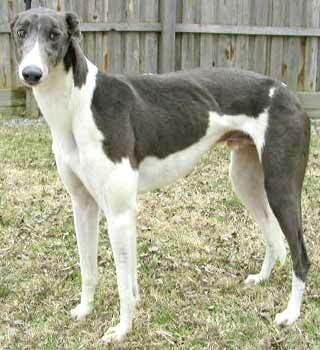 His sire is Gable Cupid and his dam is Pin Oak Angie, making his grand-sire Wigwam Wag. 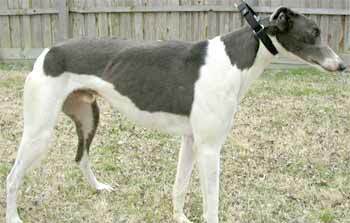 All of Salty's 4 littermates are variations of blue and white or blue brindle markings. Salty's racing career was only here in Texas from November 2001 to June 2002. He is happily retired and looking for his forever home. Salty is not small animal or cat tolerant, and should be in a home with no children.